If you run an eCommerce business, chances are it is plagued by the shopping cart abandonment problem. Over the past 10 years, the average cart abandonment rate went up from 60% to 68%, which means that only one in three sales are being completed on an average eCommerce site. With these numbers in mind, it’s obvious that any web shop that wants to recover these missed sales opportunities needs a solution that deals with abandoned carts. But before you decide on a solution, you should correctly diagnose the problem and see what the damage is. Google Analytics is an effective tool that allows you to keep track of cart abandonment rates in your store. This solution works for any eCommerce site that uses Google Analytics, not only for a Magento store. 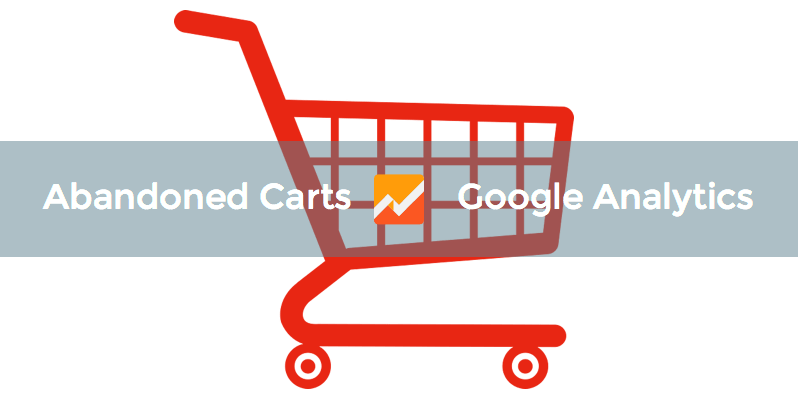 In the article, we’ll go over the step-by-step process of setting up abandoned cart tracking in Google Analytics. After you set it up, you will be able to see the weak spots in your sales funnel and estimate the share of website visitors that don’t make it to your “Thank You” page. Step 1. 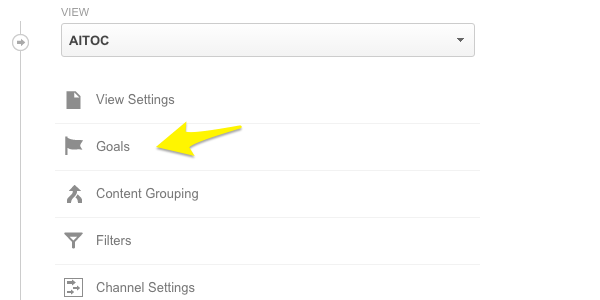 Go to Google Analytics and head to the Admin tab. Choose the Account, Property and View that you need, and click Goals. Goals are desired actions a customer takes on your site. For example, this can be a visit to a particular page, a certain amount of time spent browsing your store, a definite number of pages viewed or all sort of button clicks and other actions taken. For our purposes, we are going to use the “Destination” type of a goal. Step 2. Click +New Goal to create a new goal. In Goal setup choose Custom, and in Goal description specify the goal’s name (let’s say, “Order Placed”), then choose Destination under Type. Click Continue. Step 3. In Goal details under Destination, choose Equals to and specify the web address of your order confirmation / success page (you should omit the domain name, because Google Analytics already knows which domain you are working with). If you know your average order value, you can enter it under Value. For our purposes, let us toggle Funnel to set up cart abandonment funnel tracking. Step 4. Under Step, add the steps your customers may take before placing an order and specify their corresponding URLs. Because we are going to track cart abandonment, it’s a must that we include our cart page (1) and our checkout page (2). The Required radio button is a filter that allows you to filter out traffic that doesn’t enter your funnel through a particular page. Sometimes, turning on this filer may lead to no data having been recorded, because your customers may take different paths on your site. Step 5. 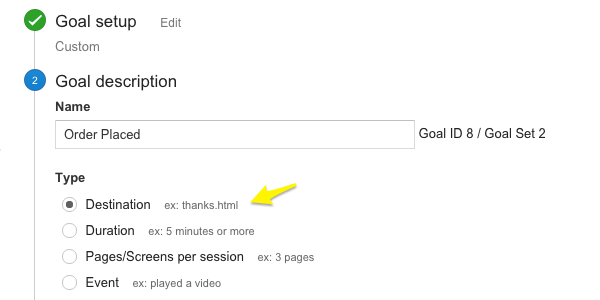 When you are done, click Verify this Goal to make sure the goal URL is specified correctly. However, the verification is NOT for the funnel associated with this goal – it is for the goal destination only. Onсe you have set up the tracking funnel, it will take some time for the data to appear there. It usually takes from several hours to several days for the numbers to become available. Of course, the longer the time period you are tracking and the more traffic you have, the more accurate your data will be. You find cart abandonment statistics under Reporting > Conversions > Goals > Funnel Visualization. 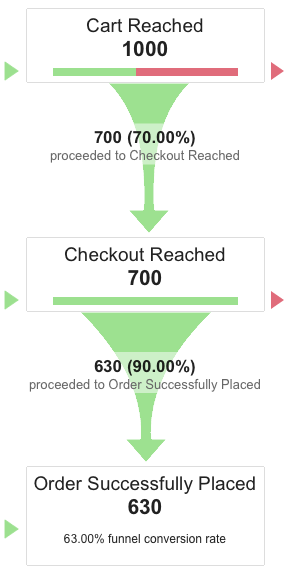 Choose the goal for which you had set up the abandoned carts funnel and see the stats. Now, some cart recovery pros such as Rejoiner’s founder Mike Arsenault consider a shopping cart abandoned NOT when a user views the cart page, but when they proceed to checkout, but fail to place an order. So, it is up to you to decide when to consider a cart abandoned, and you can analyze as many steps as possible to diagnose potential problems. OK, let us assume you’ve set up abandoned cart tracking on your site and you see that about, say, 30% of your shopping carts are abandoned (that would be a rather good number, actually). What is your next step? 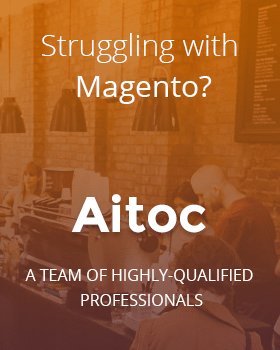 If you have a Magento website, we can recommend Abandoned Cart Alerts Pro, an extension we developed (which we use ourselves to recover lost sales opportunities on our website). It allows you to automate abandoned cart recovery to a degree where you don’t have to do anything – you only get to see the reports with all the extra revenue made thanks to our plugin.